Life is always about perspective. My original writing for today was all about staying focused and not allowing yourself to get off track by circumstances or people. Well, here was a true test of my faith. I choose to be a living example of what I originally wrote in my lost draft. Here’s the thing I’m learning, our behavior is not for God. God is less concerned with our actions than he is with our heart. How we live is important to drawing others closer to God. Men and women can’t see our heart, only God can do that. So people only know what we believe and what we are about by our actions. Start acting like what you say you believe. Over the past few weeks, Nehemiah 6 has been a reoccurring theme during my study time. Nehemiah was focused on completing the plan that God designed just for him. While he worked, other men got wind of what he was doing and summoned him to meet with them. He repeatedly turned down their requests to meet for the sake of staying on track with the work he was doing unto God. Frustrated at being rejected, the men shared with him the rumors circling about what he was doing and why he was doing it. They were all lies made up by people who had no understanding of what God had promised him. Instead of letting them be a distraction and trying to defend his name and his mission, Nehemiah never left the wall and was even more determined to finish what he started because of their ill intentions. 6 Sanballat, Tobiah, Geshem the Arab, and the rest of our enemies found out that I had finished rebuilding the wall and that no gaps remained—though we had not yet set up the doors in the gates. 2 So Sanballat and Geshem sent a message asking me to meet them at one of the villages[a] in the plain of Ono. I know that there is someone reading this who has a big vision. You have big plans that only you and God understand and that’s okay. Not everyone can handle your big dream. Here’s the great news… you and God are the majority. Don’t allow anyone to limit you based on their capacity to dream. 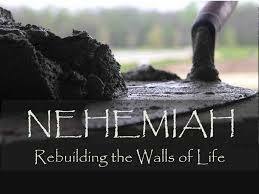 You see how Nehemiah never came down from the wall? Wouldn’t you think that eventually those men who were sending messengers to get him to come down would have actually made their way up to him? Here’s my takeaway, their whole mission was to get him to lose focus. The meeting requests and rumors were just ways to get him stop the progress he was making. Even bigger lesson is that many naysayers who refuse to support you are cowards. They don’t possess the qualities needed of a godly leader and so they send people to do their dirty work for them. Do yourself a favor and spare yourself the headache of trying to get them to understand beyond what they are capable of understanding. They aren’t built from the same cloth. They aren’t equipped to comprehend on your level so leave them where they are. Don’t stoop down to their level! It’s a set up. It will delay your progress and cause you to lose focus on what is most important. Listen, I lost over 900 words in a matter of seconds by a computer glitch. Yes it ticked me off. Yes I wanted to say “Forget it, I’ll try again next week.” BUT, knowing what my message was going to be for today that would have been a complete contradiction. Instead, I got back in front of my computer, refocused on the message in my heart to share, and starting typing… AGAIN. No matter how many times you have to do something, do it until it’s done! No more distractions as we round out this last quarter of 2014! Stay focused loves! You don’t know how close you are to the promises God has for you! Some of my best work as a poet have been lost, I understand your pain! It’s serious business.